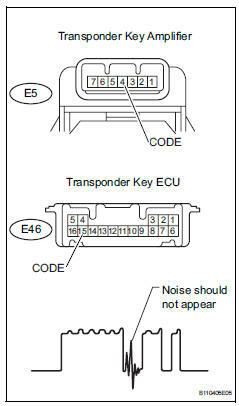 This dtc is output when a communication error occurs between the transponder key amplifier and transponder key ecu. Some possible reasons for the communication error are: 1) 2 or more ignition keys are positioned too close together, or 2) noise is occurring in the communication line. Check if the ignition key being used is near other ignition keys. Also, check if the key ring is in contact with the key grip. Separate the keys from each other and / or remove the key ring. Clear the dtc (see page ei-18). Insert a key into the ignition key cylinder. Remove it. Check that no dtc is output. Ok: no dtc is output. 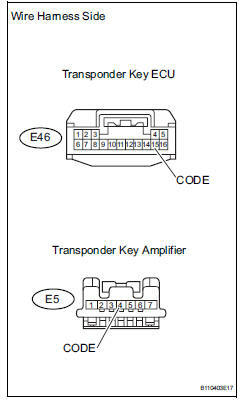 Using an oscilloscope or the intelligent tester, check for noise in the waveform between the terminals of the e5 amplifier connector and e46 ecu connector. Ok: no noise is present (see illustration). Temporarily replacing the transponder key amplifier with a new or normally functioning one. Check that the engine starts normally.